Located off the strip, at 1610 East Tropicana Street, this is the second iteration of the Pinball Museum or Pinball Hall of Fame as it is now known. After growing popularity, it moved out of its original location further away from the strip and now is home on East Tropicana street in a 10,000 sq. Ft warehouse! As you go game to game, you are always surrounded by flashing lights, the sound of balls clinking and clacking against quick snapping flappers, bright colours glowing in the dark and high scores calling you out to over take them. The Pinball Hall of Fame features over 200 pinball games, all perfectly ready to play so much time as you have a quarter in hand. Each one of them represents a different piece of pinball history and spans all different periods of time. Tim Arnold is the man responsible for this amazing collection of classic arcade games along with other members of the Las Vegas Pinball Collectors Club. Tim and the club members wanted guests to come in and relive their childhood memories of playing these arcade games in a time before iPods, iPhone, Wiis and PlayStations. Although Pinball-like games from the 16th to 17th century do exist, the Pinball machines as we know them now, with coin operated flippers and balls, only appeared in the mainstream as early as 1930. 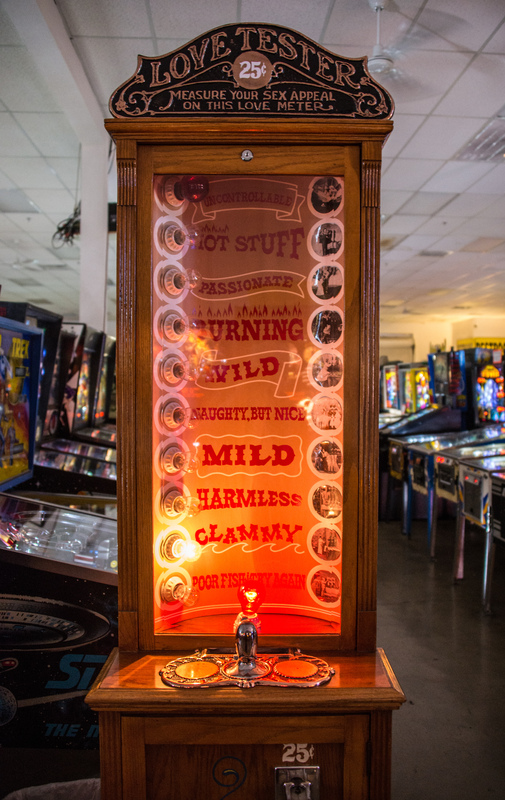 The Pinball Hall of fame is home to some of the earliest games in arcade history, and although they might not have all the bells and whistles as some of the modern machines, these games are steeped in history. Their designs evoke the culture from which the game was made, and as your place your hands on the slides to keep that ball from falling that hole; you can almost feel the decades of people that came here before you. Despite many of these machines being made decades ago, each one of them works like new! And by no mistake either. Tim and his team work tirelessly to restore these machines to their original working condition to make the experience for the customers as close to the original as possible. The other amazing thing about this place is the price. There is no entrance fee, all you need to do is put money in the machines. Unlike places like Dave and BustersOr other chain video game arenas, they cost almost as much as they did 30 years ago. Older pinball machines are 25 cents a play, and more modern models are 50 cents a game. In a city where losing your money for nothing is easy, this place makes you feel like your buck not only stretches pretty far, but every game is a riot and a blast to play. There's no feeling defeated after you've dropped your coins down a slot, only feeling the joy of being a kid again. The Pinball Hall of Fame is a non-profit organisation. It relies on people coming in to play their games to stay afloat. They also subset their expenses by restoring old pinball machine for other arcades and selling a "Pinball Repair" DVD for self-service repairs. So, if you do come in, be sure to play a few games, buy a coke from one of the old soda machines and snack on Mike and Ikes from the retro candy dispensers. We stayed here for hours! Every machine has something special that you just HAD to play to see. My favourite games that I had the chance to play where mostly the older ones. The Elton Johngame from the old Bally's Casino was hilarious, and the illustrations were perfection! Some of the oldest machines were a blast from the past and their mechanics very interesting to explore. They were so unique, and it was fascinating to see how they developed and were refined over time. Dan managed to find an old WWF game, and that was his clear favourite. I have to say, it was pretty cool and was from one of the best time periods in wrestling history. Again, the design and illustration of the graphics on this machine was so fantastic and the different voices from the wrestlers that came on while playing certainly took you right back to the attitude era. The game with the best music was for sure the old Star Wars game. The John William's score still sends goosebumps up my arms and reminds me of my own childhood. The two games with the best surprises were the Twilight Zone and the X-men Magneto machines. The Twilight zone has different levels that would open up like staircases as your score rose. It was so cool and honestly sometimes would take you away from watching the ball, just admire the different transformation the board was doing. The X-men game also has fantastic voice acting, sliding and shifting ball ramps that move like a maze and a board that adapts itself to the story that the game is telling as you go. I have a soft spot for X-men, so this one touched my heart and kept me there more quarters than I care to admit. In addition to Pinball Games, they also have some very distinctive arcade games. One which we loved was the bowling game that came with real yet slightly more minature, pins and balls that you threw down the lane. They also had a few whimsical love testers which are never something we can pass up, even just for a laugh. All in all, this is for sure one of the best things to see in Vegas. Visitors often never leave the main strip, and it is for places like this, that I implore you to do so. Vegas is more than just casinos and booze. There are incredibly rare and fabulous places to visit, created from dedicated collectors keen to share their passion with you. I will be, and I am counting the days until I can be surrounded by that sweet lullaby of rings, dings and shiny bright lights. A mini Vegas all in itself if you think about it.